Pro Tools | What About This For a Mac Pro Replacement For Pro Tools? What About This For a Mac Pro Replacement For Pro Tools? Sonnet Transform a Mac mini Server with Thunderbolt Technology into an Rack Mount Server! In many applications, a Mac mini or Mac mini Server with Thunderbolt technology can easily take the place of a full size server, but the size and form factor can limit its potential. Most importantly, it doesn’t provide slots for PCIe expansion cards to increase its functionality, connectivity, and storage. 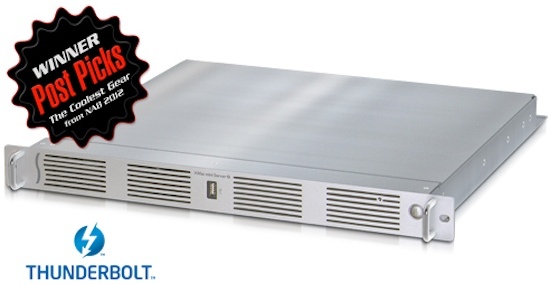 Sonnet’s xMac mini Server PCIe 2.0 expansion system/1U rackmount enclosure (formerly known as RackMac mini Xserver) addresses these issues and expands a Mac mini Server’s potential in a big way. Front Panel Operation—Front panel power button activates power switch on Mac mini; USB port enables connection of keyboard, mouse, thumb drive, etc. Now it isn’t Pro Tools approved yet, but it does provide an interesting option for high end Pro Tools users. The box is due for release in June and the projected price is $1295 plus you need to buy a Mac Mini but even then, it still isn’t silly money compared to a Mac Pro.